The Word of God constantly reminds us of the importance of living by faith. Have you ever wondered how to really live day-by-day and moment-by-moment by faith? 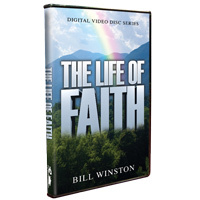 In this timely and highly instructive series titled “The Life of Faith”, Dr. Bill Winston shows you how to live a life full of faith and victory in Christ. Learn why faith worketh by love, why you have to “mix” your faith, why you must speak positive words for your faith to work, and much, much more! Let the biblical truths shared in this series show you how to embrace and enjoy the life of faith.